From gvSIG we can export our vector layers (parcels, roads, rivers…) and load them in Google Earth. Layers that we create, as well as layers downloaded from the different public administrations websites, can be visualized in Google Earth, exporting them from gvSIG. To be able to load that information in Google Earth we must have it in KML format, that is the vector format supported by it, so we have to export our SHP file to a new layer. 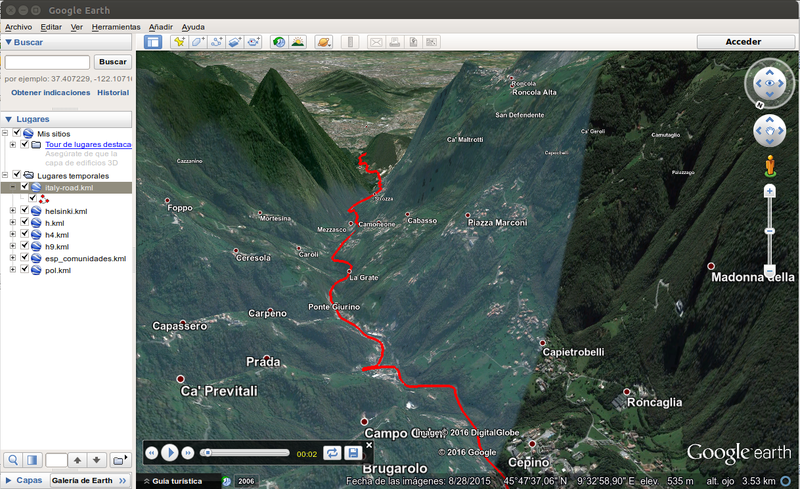 For that, we have to load the layer in a View in gvSIG, and put it in active mode. Then we’ll go to ‘Layer’->’Export to…’ menu. At the first window we’ll select the KML format as export format. Then, at the next window we’ll be able to mark the “Show attributes in balloon” option, that would allow us to get the information from the attribute table when we click on an element in Google Earth. In case we have the view and the layer in gvSIG in a reference system different to the supported one in Google Earth, (geographic coordinates, WGS84 Datum, EPSG4326), it would allow us to select the option to export the layer in that reference system. At this way it would be visualized correctly in Google Earth. At the next window we would indicate the output file, and at the end window we would indicate what elements we want to export (all the elements, only the selected ones at that moment on the layer or the elements that meet a requirement by a filter). The KML file that has been created will be the file that we will be able to load in Google Earth. For that, once the application is open, we go to the File->Open menu. When we select the KML file from our computer it will zoom on the area where our cartography is. If we had marked the option to show the information of the attributes, when we click on them a box will be opened with that information. If the layer is made up by a line, like a footpath, we would be able to fly along the path in an automatic way. This entry was posted in english, gvSIG Desktop and tagged Google Earth. Bookmark the permalink. 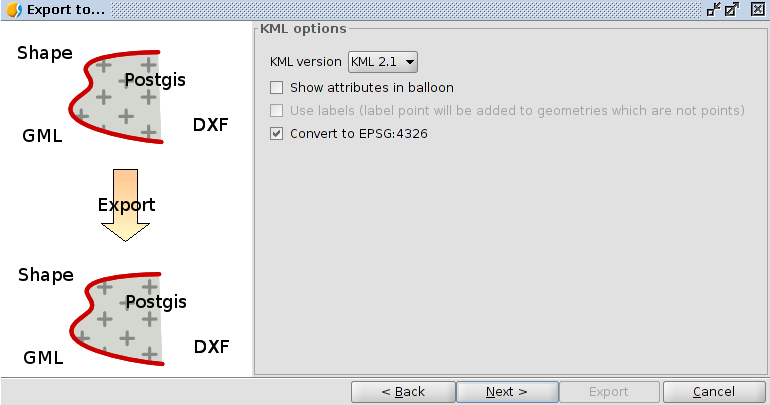 Is it possible to convert a Dxf file to kml file by Gvsig? If yes how? Yes, you can do it. You have to create a View in the same reference system than the layer, then load the dxf file, and finally follow the same steps indicated at the video of this post. It can be converted from the “Layer->Export…” menu.